The oil downturn has created some interesting opportunities for dividend investors, but these two stocks should probably be avoided. The oil price decline that started in mid-2014 sent the industry into a tailspin. And it may have created some buying opportunities for contrarian dividend investors. However, not all companies are created equal, and CorEnergy Infrastructure Trust (NYSE:CORR) and BP Plc (NYSE:BP) are two dividend stocks that are too unsafe for most investors. CorEnergy is something of an experiment. It is structured as a real estate investment trust (REIT) but owns oil and gas midstream assets. It's the first REIT to go down this path. Normally the pipelines the REIT invests in are owned by limited partnerships. It's an interesting model, however, because CorEnergy gets paid rent, not a fee, for the use of its pipes. If you're looking for dividends, meanwhile, the company's 10%-plus dividend yield may sound pretty enticing. But the business is being put to a pretty severe test right now. That's because the company's two largest tenants are oil and gas drillers working their way through bankruptcy court. And that's a big risk, because together they account for roughly 90% of CorEnergy's rental revenue. In defense of CorEnergy, the pipelines it's renting to subsidiaries of Energy XXI and Ultra Petroleum are vital assets. Without the pipelines to move oil, the wells these companies operate can't get their oil and gas to market. That's why these two tenants are still current on their rents. But until both have emerged from bankruptcy, there's a huge question mark over what will happen at CorEnergy and, more important for dividend investors, with what will happen with the REIT's dividend. With so much up in the air, oil gas prices still hovering at relatively low levels, and no quick resolution in sight, CorEnergy just isn't worth the risk for most dividend investors. Another oil and gas-related company with a nice yield is BP. In fact, its roughly 7% yield is around twice as high as that offered by ExxonMobil (NYSE:XOM), one of the industry's best run companies. They are both international energy majors with operations spanning from pulling oil and gas out of the ground to moving and processing it into things such as gas and chemicals. One of the big reasons BP yields so much more is in part from the lingering impact of the 2010 Deepwater Horizon Gulf of Mexico oil spill. To be fair, the financial impact of that event is largely defined at this point, with the roughly $19 billion settlement the company inked in mid-2015. There are still cases pending that could lead to further, though likely relatively small, additional costs. So on the back on the envelope, you might call the cost $20 billion. That cost is going to be spread out over a roughly 15-year period. But think about that another way: For the next 15 years, BP is going to have to deal with a material extra cost that won't be burdening its competitors. Add in low oil and gas prices, and BP is clearly operating at a disadvantage right now and probably for years to come. 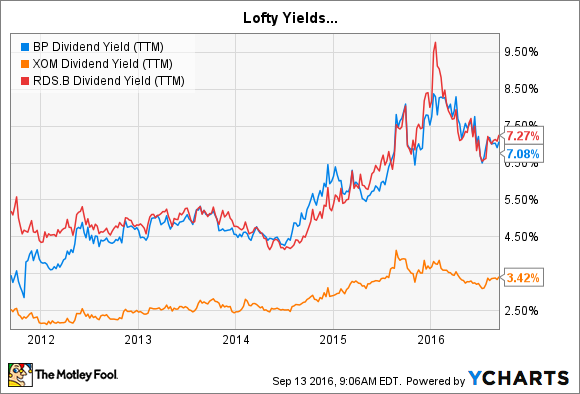 Although you could argue that the high yield is compensation for that risk, there are still better options in the space. For example, Royal Dutch Shell Plc (NYSE:RDS-B) yields a little more than BP partially because of an aggressive acquisition in the face of the industry's downturn. I'd rather own a company taking risks to grow than a company that's risky because of the lingering legal costs of an oil disaster. Not every dark cloud has a silver lining. While only time will tell if CorEnergy and BP's clouds eventually clear to reveal sunny skies, most dividend investors would be better off looking at safer alternatives. Indeed, these are two dividend stocks that are too unsafe for all but the most aggressive.